Until now we’ve seen what TDE is, how to enable it on a Database, what are the key considerations which we should never forget as a DBA while dealing with Encryption stuff..bla bla…!! 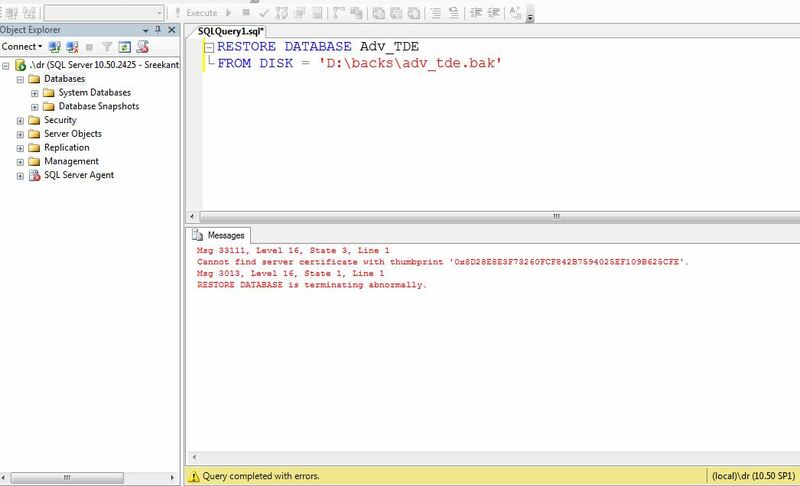 In this post of the Encryption Series, let’s actually see how to Restore a Backup of a database which has TDE enabled on it. As i mentioned earlier, we can’t restore a backup on a different instance without Certificates. We’ve to restore the Cert from Source Server , then we should be able to restore the Database from the Backup. 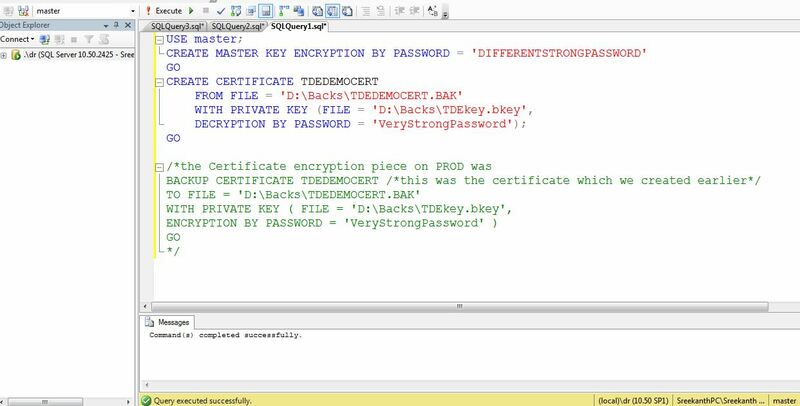 Note: Enabling TDE on a Database encrypts every single portion of the database. It includes mdf, ldf and any ndf’s as well. All your Database Backups are encrypted as well once you turn ON TDE!! Heyyy…that’s awesome!! One thing you should be aware of is, If you are using FileStreams, they are not going to be encrypted with this TDE. All We’ve to do is restore our Certificate from source(And you have to create a DMK on destination if you don’t have one), Once you are done with that piece of puzzle, the rest is just performing your normal DB restore process what you do on any other non encrypted user database(s)! So..Basically all we need to do is creating the certificates on the destination Instance from the backup of your certificates which we created in earlier post. Now let’s do the actual restore and see how it goes…. Perfect!!! Once we created certificates based on the Cert backup from PROD Instance, we were able to do Restore!! Soo….Key thing to remember is to Backup your certificate and store it in a safe as soon as you’ve Encrypted your database. I want to stress again – If you loose it, you lost everything related to your Database(You are safe as long as you can access the source database)!!! 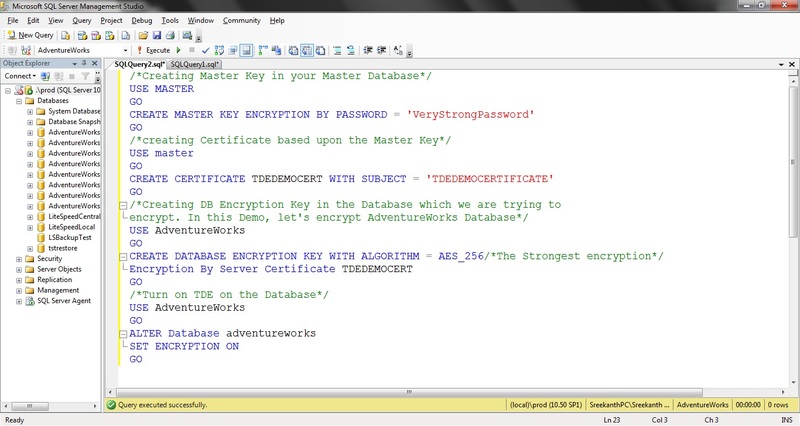 In the Previous two Posts of this series, we’ve seen how to actually encrypt our Database(s). 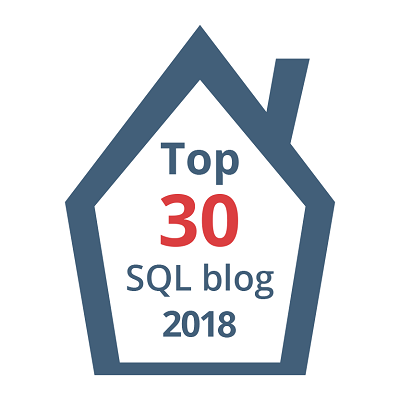 In this post, let’s focus on things to consider on Databases with TDE enabled. Let me tell you something…there are lot of GOTCHAS as a DBA for Encrypted databases you should be aware of. You should not be in a situation saying “Oops! I missed it, what should i do now?”. Reminding again….If you loose your Master Key, You’ve lost your Database, No Ifs and buts! If you are creating a DB Encryption key with AES_128/AES_256 Algorithm and if you lost it, i believe it would be a very tough challenge even for an ethical hacker to decrypt it ;)(I might be wrong, but I would expect the same level of encryption what i’m saying!!) Okay!! Enough Scaring you all, let’s get into the actual content! Very first thing, Encryption adds a little Overhead on your CPU. Thorough testing is mandatory! If you enable TDE on any Database on your Instance, Your TEMPDB is automatically Encrypted as well. Soo…there’s a high possibility impacting other Databases which are actually not using TDE feature while you are in the process of enabling TDE!!! Instant File Initialization won’t work on TDE Enabled databases and Log truncation won’t happen through the Encryption process(While Background Encryption scanner is in progress). So, keep a close eye on your LDF file when actual encryption process is in progress. You’ve to backup your Service Master key, Certificates and Master key and secure it in a safest location(Far away from where you store your Database Backups. The idea is not to have access to your Keys for any intruder even though he/she got hold of your DB Backups! 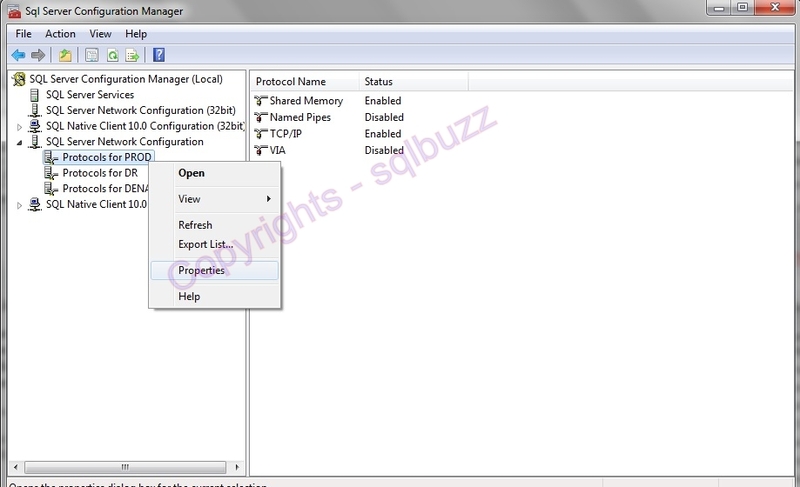 How to Backup your Service Master Key?? How to Backup your Master Key? How to Backup your Database Key? That’s all for the day! Let’s see how to actually restore a Database which is Encrypted on a completely different server in the upcoming post of this encryption series. 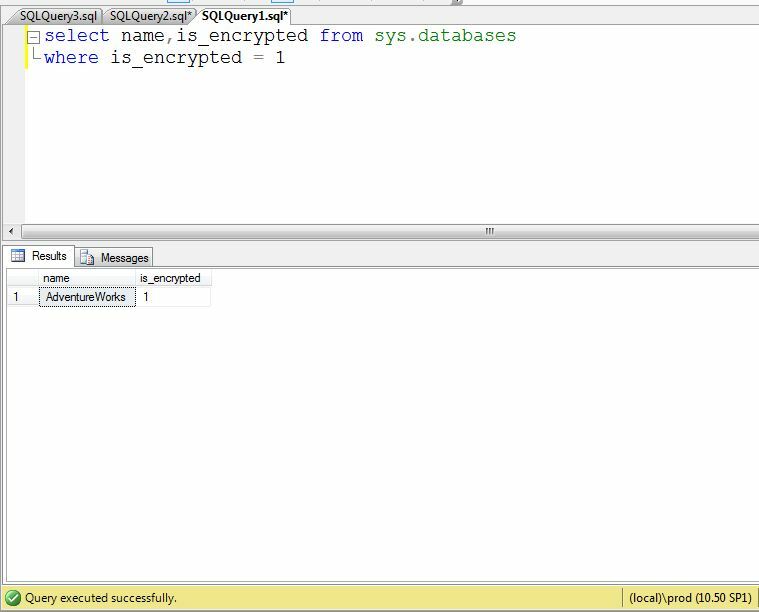 This is the second part of the Encryption Series, In this Blog post let’s see what can be achieved within SQL Server in terms of Encrypting the Data. 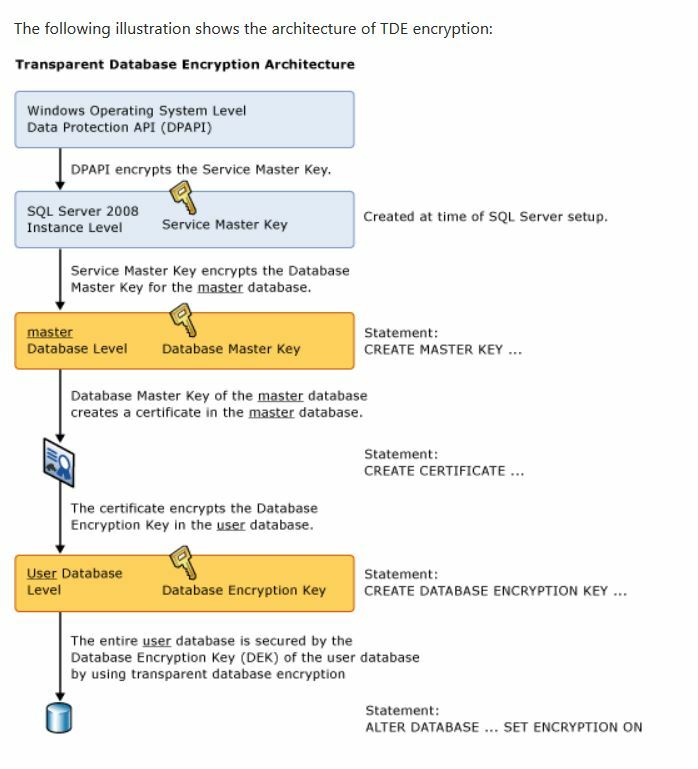 In Legacy days……..Prior to SQL Server 2008(Enterprise Edition), we only had an option to encrypt at Column level/Cell level not at the Database level. 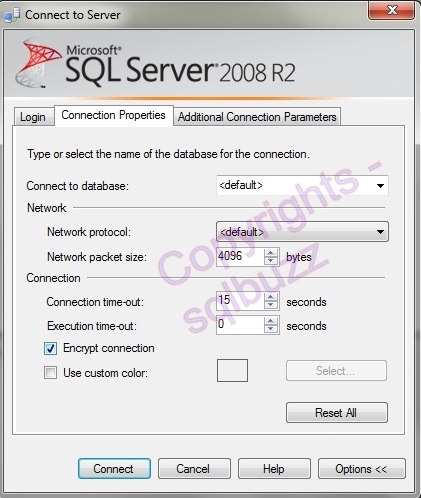 Even in SQL Server 2008 if you are using standard edition of SQL Server, you don’t have an option to encrypt at Database level. So…Basically we’ve to make this possible manually on every column by making use of either of the following inbuilt functions which SQL Server offers us.. 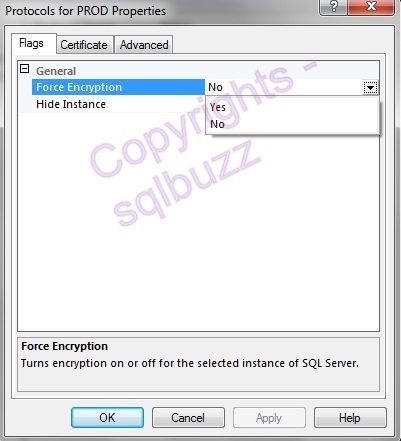 If you are on Enterprise Edition of SQL Server 2008, we’ve a brand new feature TDE(Transparent Data Encryption) which is at Database level and completely transparent to developers or anyone who is actually accessing our Database!! Nothing needs to be done from developers standpoint, basic testing is necessary though(Since it could cause 3-8% CPU hit under the hoods as per Microsoft documentation). All the Encryption and Decryption routines are completely transparent:) which is AWESOME! 2. 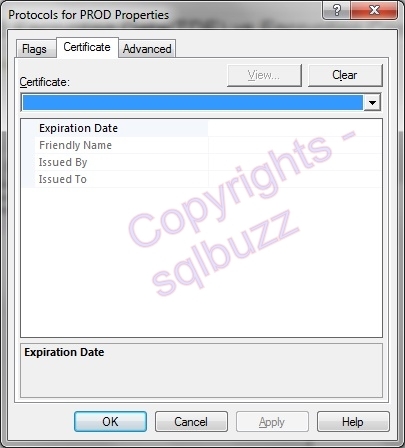 Now, create a Certificate(in Master Database) based on this Master key. 3. Now, create a Database Encryption Key(In the Database which we are trying to Encrypt) and the final Step would be Turning on Encryption at Database level. Cannot change database encryption state because no database encryption key is set. Please see the below Screenshot which covers all the Required Steps to Enable TDE on a given Database. Technically, That’s all we need to do for encrypting a Database! Pretty Simple huh? Note: You’ve to provide a very very Secure Password(I would say 20-30 Characters including all kinds of Alpha Numeric Combinations and store it in a safe) for your Master Key. How to Verify whether your database has been enabled with Encryption? 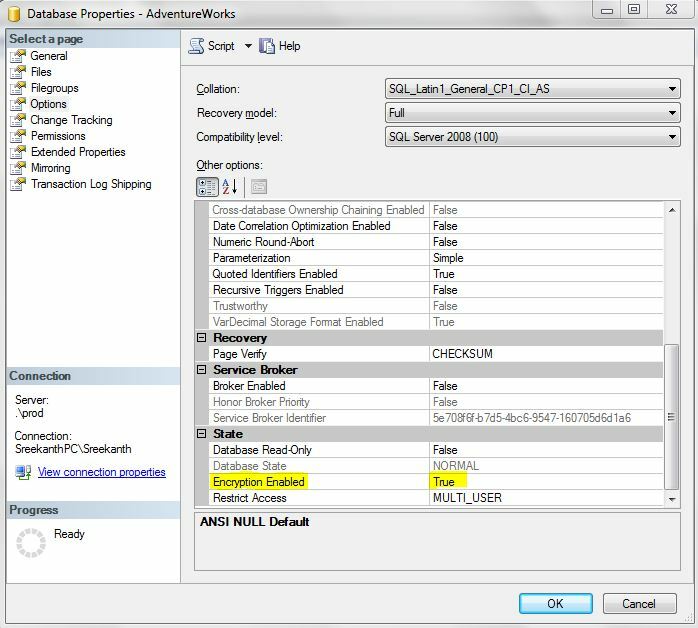 You can Go to Database Options from SSMS as shown below or Just Querying the Sys.Databases view! Int the next post of this Encryption Series, let’s see what are the challenges we’ve while dealing with Encrypted Databases! There are quite a few things to keep in mind as a DBA in order to Support TDE enabled Databases.